According to the NAACP Board of Directors? Vice- Chairman Derrick Johnson, every five to seven years, the NAACP revamps, reenergizes and reimagines itself and considers its current positioning as the nation?s oldest, largest and most widely recognized grassroots-based civil rights organization. New strategies are put in place to tackle a range of ongoing issues from voting rights to education reform; new leaders come and go; and bold steps are taken to, overall, improve conditions in Black communities. 2017 is one of those years.? There is talk of new direction and new accountability and even a new president as current president Cornel Brooks? contract nears expiration in June. Past presidents have included Benjamin Todd Jealous who served from 2008 to 2013. ?The NAACP was founded more than a century ago in response to the rampant and violent lynching of black Americans. Over the past 100 years, the black community and communities of color as a whole have experienced tremendous advancements. Yet, as we continue to march towards the arc of justice, additional barriers have been placed in our way in the forms of voter suppression: increased police brutality, over criminalization of black bodies, income inequality and inadequate health care as well as anti-immigrant sentiments,? 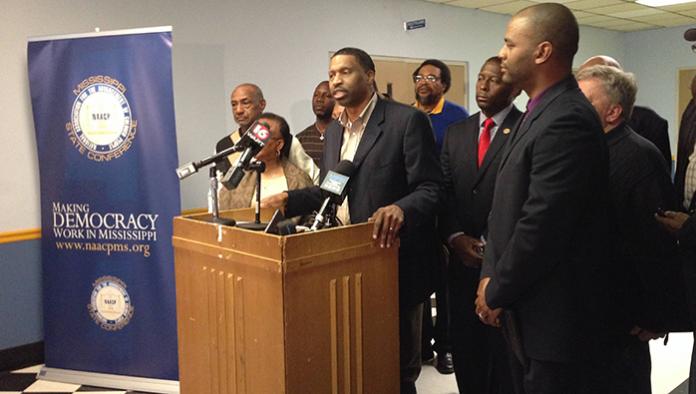 NAACP board members cited in a statement released on Friday. Civic engagement, environmental and climate justice, and disparities in health, education and economics are just some of the issues the 108-year old organization is currently working on in addition to continuing its role as legal advocate for civil rights issues. On the heels of the NAACP?s board announcing, last week, its plans for a ?transformational retooling of the organization,? TNJ.com sat down with Vice-Chairman Johnson to discuss the particulars. TNJ.com: The NAACP recently announced plans for a ?new direction and new accountability.? Tell us about that. Derrick Johnson: Currently, we are doing a review of the organization as we begin to go through our strategic planning process. It?s pretty common for us to do this every five years or so to make sure that our focus is targeted towards the relevant issues of today; we also want to ensure that the approaches we take and the systems we use are adequate in terms of our ability to be effective. For example, we?ve taken a look at our communications delivery system in preparation of any needed overhauls so that we can be more relevant and timely to our youth across the country. We are looking at our workflow to make sure we are more efficient in how we operate internally with our national staff and their ability to get information or support to our local units. The biggest thing that prompted all of this was a question around whether or not we are being accountable to our members on the ground and how we could build their capacity to be more effective in their work in local communities. We are approaching the 20/40 Redistricting Cycle which is a pivotal point in our ability to impact policy because of how district lines or political bodies are drawn from the school district level all the way up to congressional will have a keen impact on public policy for years and we simply want to be ready for that process. TNJ.com: News has spread that the NAACP is embarking on a 2017 listening tour. What is that about?? Johnson: It?s our way to hear from our constituents on the ground both internally and externally so it will look different in different locales based on our assessment of the need. It will take different forms in different states. For example, I?m in Mississippi ? a rural state. How we gather information here may be completely different than how we gather information in Detroit, which is our largest unit. In some areas, we might do focus groups; in other areas, we might convene stakeholders.?? So, we are pulling together that design now. We?ve initiated this by first listening to our staff to hear, from their vantage point, how they see the organization being more efficient in its operations. TNJ.com: What, if any, changes in leadership will take place? Is it true that President and CEO Cornel Brooks will leave in June. Johnson: Yes, President Cornel Brooks will leave in June. His contract ends at the end of the month, and we appreciate all that he?s done. We also looked at board leadership and made changes in February. So, as we do the assessment we are also looking at how we are structured in terms of governance, governance leadership, and execution in terms of staff to make sure we are optimizing our ability to impact the quality of life of our constituents. TNJ.com: Any idea of who the new leader will be or are you keeping that under wraps for now? Johnson: It will be a political process. We want to make sure we look at how we are set up whether or not our set up for accountability is where it needs to be, and then hear from our members so we can inform what the process will look like for the selection of the next person. For you and I, we might say Person X is the best person, but after we do a complete assessment, we may realize that our growth area might be in Area X and the person we think is good for the job may not be the person we need at that juncture. TNJ.com:? What is the organization?s position on the proposed fiscal year 2018 budget from the Trump administration? Johnson: I think it is detrimental to the quality of life, not just for African Americans, but for all people. If you look at the NAACP, we measure the health of any society or local governance based on some broad primary factors, for example, how well we are caring for our elderly. This budget undermines the stability of the elderly and puts their safety net at risk.? If we are equipping our young people with a quality education, this budget does nothing to further the delivery of quality education for all children. Again, it, undermines that; and if we are protecting the disadvantaged, those who are most in need based on economic condition or in need because of some level of disability, this budget undermines their protection. So we see this budget as furthering and/or creating an unhealthy society. TNJ.com: Any short- to long-term goals you can speak on?? Johnson: Our long-term goals are to make our units stronger and more effective in impacting the formation of public policy in a way in which we can create a healthy community and a healthy society; we see on the horizon the redistricting process I mentioned, and we seek to protect the safety nets that we?ve created over time; we will continue to advocate for access to voting, free of any impediments such as voter suppression and voter ID; and we will continue to fight for a quality education delivery system that is consistent throughout states and across states.